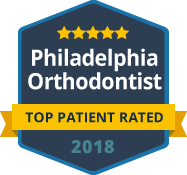 Self-ligating braces are a progressive advancement in orthodontics, and Broad Street Braces is excited to offer this treatment option. Self-ligating braces look very similar to traditional metal braces, with one exception; there is a small door on each of these braces, which allows the wire to sit in the brace without needing a color tie to hold the wire. Dr. Neil is trained to use several self-ligating bracket systems, including the Damon Bracket System and the Empower Bracket System. Self-ligating brackets can be easier to clean, more comfortable, and offer shorter treatment times and fewer appointments for certain patients. Schedule a complementary consultation to see if self-ligating braces might be a good treatment option for you.